be sure that all of our campers are safe during their time at camp. Through involvement with positive role models in our many different activities, campers learn to enjoy recreation in a non-competitive atmosphere, respect the rights of others, take positive risks, and learn to make choices in a fun and caring environment. At the same time they are gaining positive self-esteem and long lasting friendships with peers and adults. The Nobles Day Camp is fortunate to have access to incredible facilities. It is located on the campus of the Noble and Greenough School in Dedham and our 187 acre campus abuts the Charles River. nests (small groups) of 12-16 campers and 3-4 counselors, with a counselor/camper ratio of 1:4.
emotional and developmental stage of their growth. Nobles Day Camp is all about choices!!! Campers are placed in co-ed groups of children all entering the same grade next fall. Each group has a morning and afternoon swim (one instructional; one free swim) and a group lunch period. Campers supplement the rest of their day with choices from their age appropriate activities list. Each group has a unique schedule which offers children a choice of three or four different activities each hour. At the beginning of each hour, a child chooses the activity in which he wishes to participate. 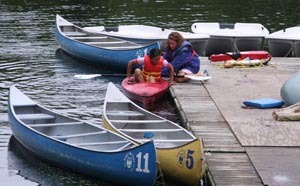 Although counselors encourage every child to try new activities, the final decision rests with the camper. Groups balance the many exciting on-campus Noble’s activity choices around their trip schedule. Our Seniors, Eights and Nines all travel out of camp at least once per week.